We often make pizza at home, though I have used prepared dough for a while. I might just have to start using my own dough. The commercial ones never seem to stretch right or they are sticky, or thin, or some other reason I don’t really like them. 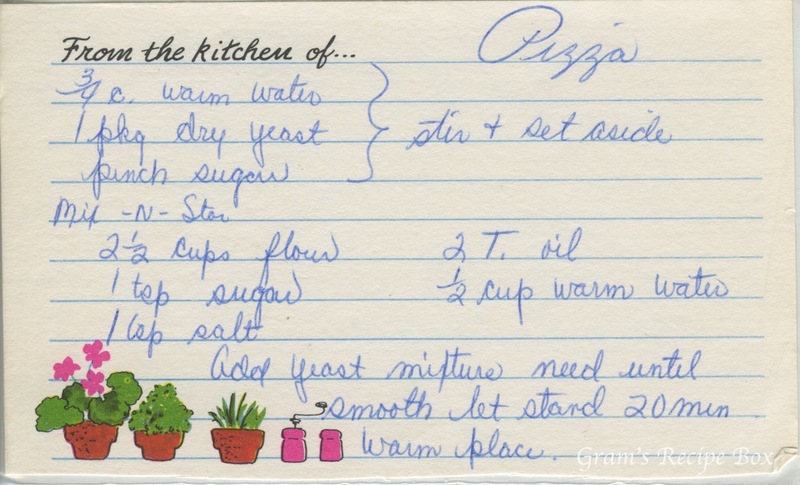 What is your preferred method for making pizza? I’m not above a frozen one, either. :-) This pizza appears to be a cheese pizza and I’m not certain about the flavor. No oregano or other Italian seasonings are used, and I think I would change that, add some garlic, and probably pepperoni. That’s my choice, of course. Add yeast mixture, kneed until smooth, let stand 20 minutes warm place. Pour oil in cookie sheet. Sprinkle with salt. Spread dough on cookie sheet. Let stand 15 minutes. 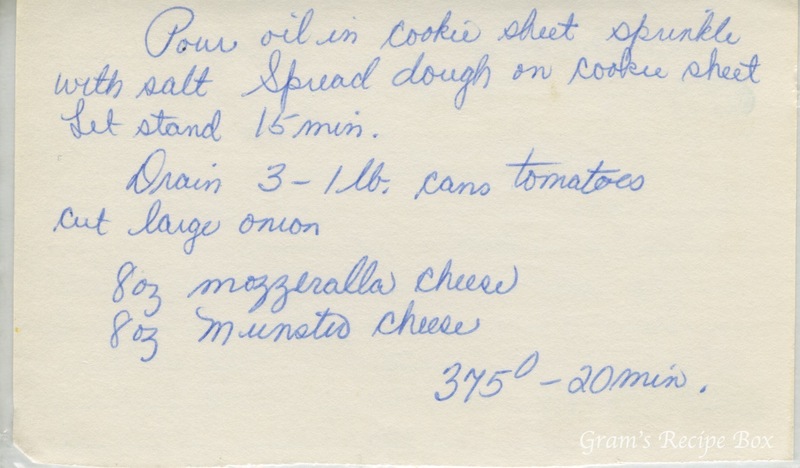 The dough recipe looks pretty good, but the rest…slightly odd. I confess, I use prepared dough from TJ’s, but I agree, they don’t quite stretch exactly how I want. We just use a jar of spaghetti sauce (usually have an open one) and mozzarella and usually make one side cheese and one side pepperoni. Lately we’ve been making an adult pizza, too, with all sorts of leftovers. A usual pizza for us would be pepperoni, salami, maybe a few meatballs pieces or chicken with red/green peppers, mushrooms and just a smidge of onion (usually red). Throw some diced fresh tomatoes on there and those lonely marinated artichoke hears left in the jar that you don’t know what to do with, and it’s gourmet!